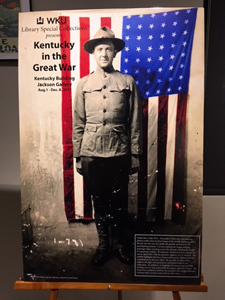 The Department of Library Special Collections invites you to view an exhibition titled “Kentucky and the Great War” through January 28 in the Jackson Gallery found on the second floor of the Kentucky Building. The exhibit highlights several themes including military service, the costs of war, life on the home front, and the effects of war on the family. Over 150 artifacts, documents, photographs, posters and sheet music specimens are used to document Kentucky’s involvement in the war effort. World War I (July 1914 – November 1918) was a global and devastating conflict that attracted the attention of the world’s leading powers. Shortly into the war, the death toll crescendoed for all nations involved in the hostilities. German submarines began sinking passenger ships traveling across the Atlantic resulting in the deaths of many American civilians. In response, American forces entered into the war in April of 1917 with support from most United States citizens. A medic uniform and helmet worn by a Kentucky soldier. This exhibit highlights the lives of a few Kentucky soldiers and their contributions to the war effort. We are able to follow our soldiers from the U.S. to France via correspondence and photos. In addition, we take a look at the home front and how civilians on U.S. soil, particularly Kentuckians, aided the troops from home. The ‘Great War’ resulted in millions of lives lost on all fronts. This exhibit aims to honor their memory and celebrate their lives. 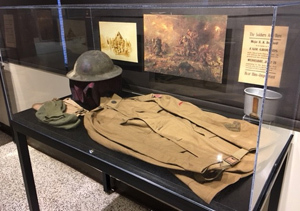 One of the exhibit cases features letters, photographs, and other memorabilia documenting the supreme sacrifice made by George Dewitt Harris of Simpson County, Kentucky. The Harris Family Collection contains well over 50 letters written by George, a lawyer from St. Louis, to his family back in their hometown of Franklin. They brim with confidence and are filled with detailed insights into military life from an educated professional. George was wounded near Epionville, France when a piece of shrapnel broke his jaw as he aided a wounded commanding officer off the field on October 7, 1918. George died a week later and was buried in France. Later letters document how the family handled the grieving process as they continued to search for answers surrounding George’s death. The collection also documents the eventual return of George’s body to the U.S. and internment in Franklin’s Greenlawn Cemetery. 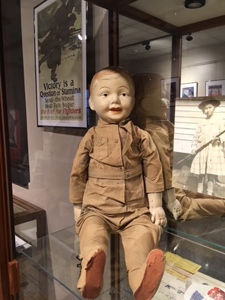 A doughboy doll from the Kentucky Museum. Another case documents the construction of Camp Zachary Taylor, the largest of the sixteen cantonments built in the continental U.S. Camp Taylor, located near downtown Louisville, consisted of nearly 2,000 chiefly frame buildings which hosted nearly 40,000 troops at a time. Despite its vast size the cantonment was built in a mere 90 days. It closed in 1920 and only one of its buildings still stands today. The main purpose of the exhibit is to demonstrate how international events trickle down to the local stage. It all boils down to one person at a time being engaged in the event, whether that person served in the military or participated in the war efforts on the home front.